Once again, the Apache-Sitgreaves National Forest (ASNF) is looking for volunteers to help relocated and record archaeological sites! 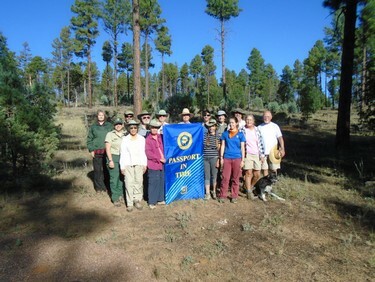 The ASNF is located in east-central Arizona, and sits above the Mogollon Rim. This area of Arizona played an important part in the cultural story of the Southwest, and continues to do so today. As technology improves, archaeologists on the ASNF have noticed that our data are no longer viable, and we need you to help us remedy that situation! Not only will you be helping us to create better data but you'll also help us to add to the story of the Mogollon Rim. During our project, we will be looking for archaeological sites that have been previously recorded, but that do not have good locational information. Once we find a site, we will photograph, describe, map the area with accurate GPS equipment, and document any artifacts. If we are lucky, we might even find sites that have never been recorded! So, please join us this fall for another "hike into the past!"